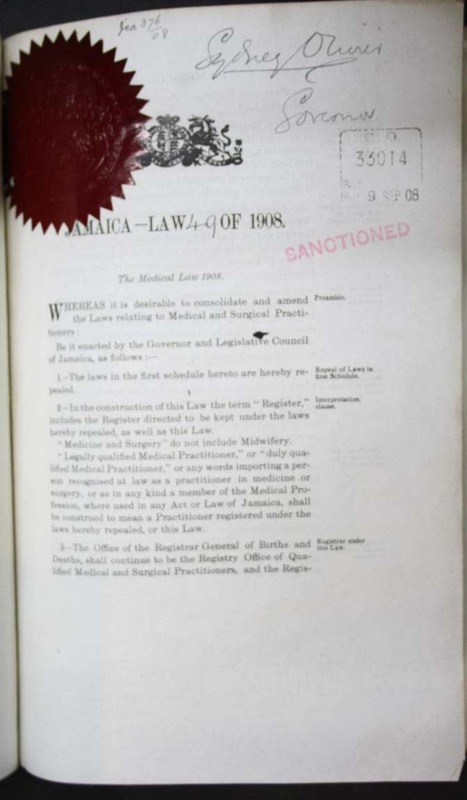 This law does not directly deal with obeah, or indeed with any aspect of religion, but we include it here because many individuals in Jamaica, including George Forbes, faced prosecution under both the Medical Law and the Obeah Act. 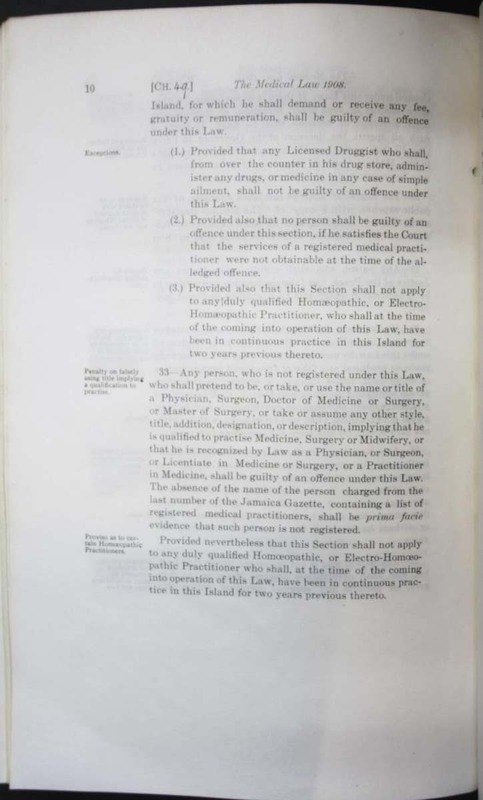 Punishments under the Medical Law were significantly less severe than under the Obeah Act–those convicted could be fined, but not imprisoned or flogged. 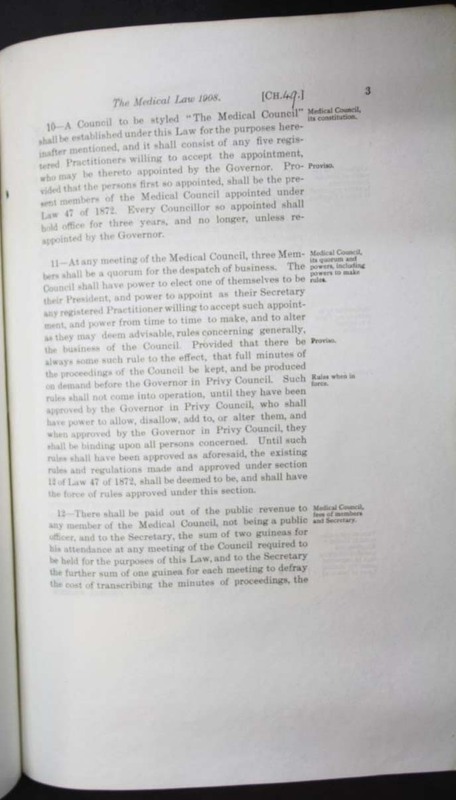 The explicit purpose of the Medical Law was the regulation and professionalization of the practice of medicine. It was similar to that passed in England in 1858 and amended in 1886. 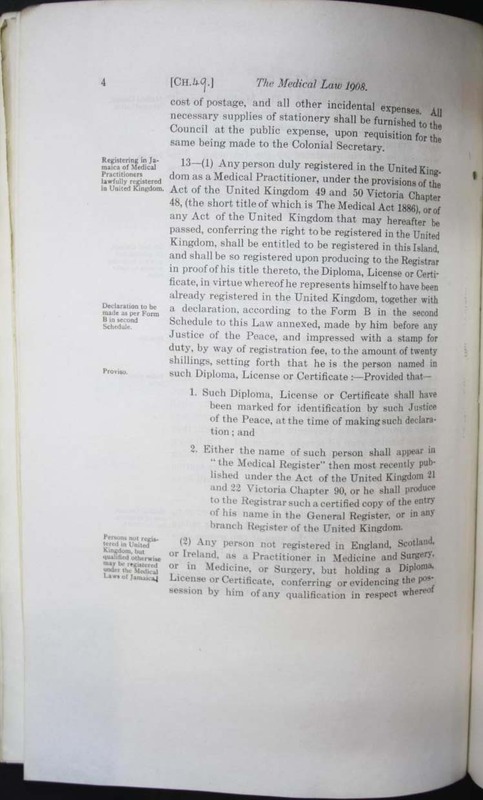 In both England and Jamaica, the Medical Laws created systems of registration for those recognized as medically qualified. 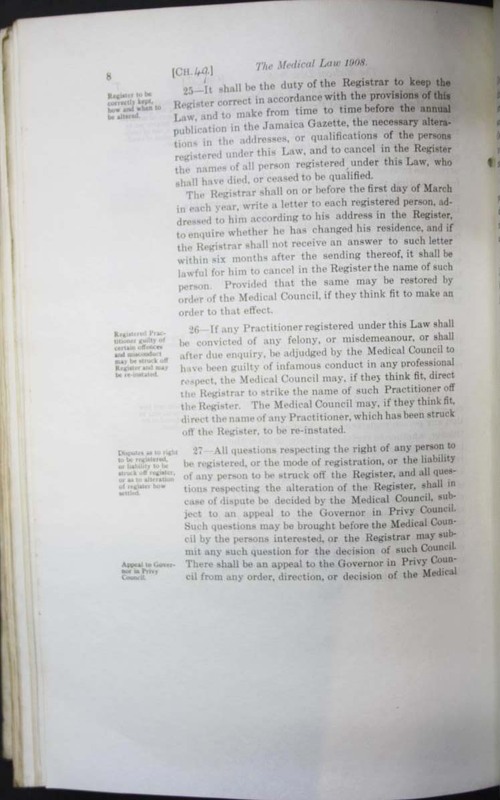 It was illegal for unregistered people to practice medicine. 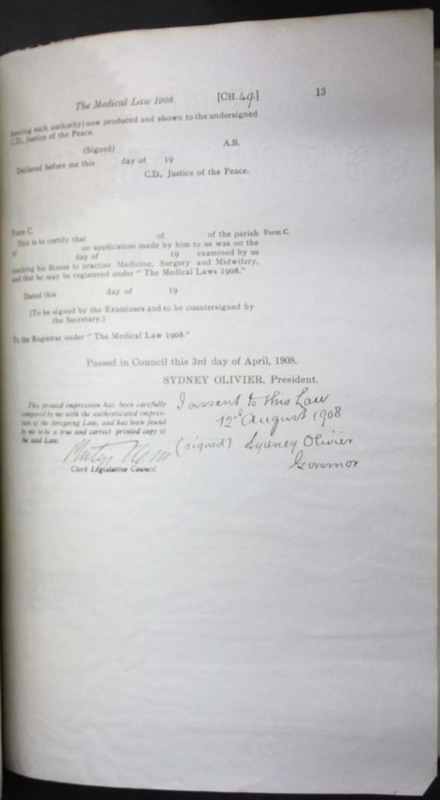 Cases under the medical law often turned on the question of whether the defendant was practising medicine, or just giving advice. 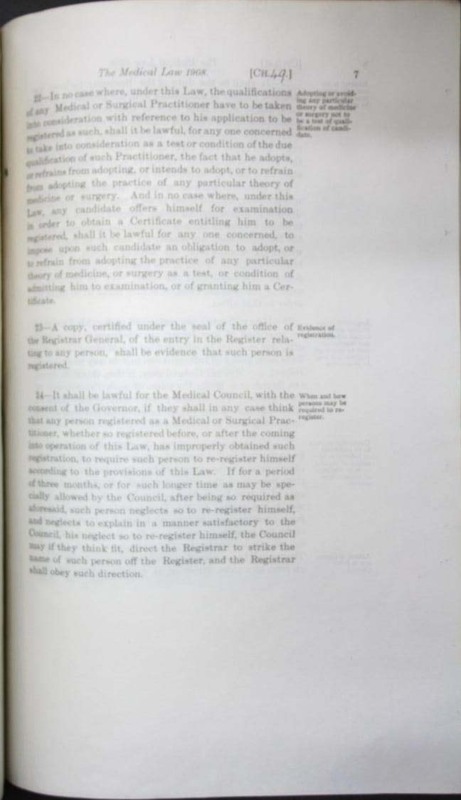 32 – Any person who is not registered under this Law, but who shall nevertheless practise Medicine, or Surgery, or perform any surgical operation within this Island, for which he shall demand or receive any fee, gratuity or remuneration, shall be guilty of an offence under this Law. (1.) 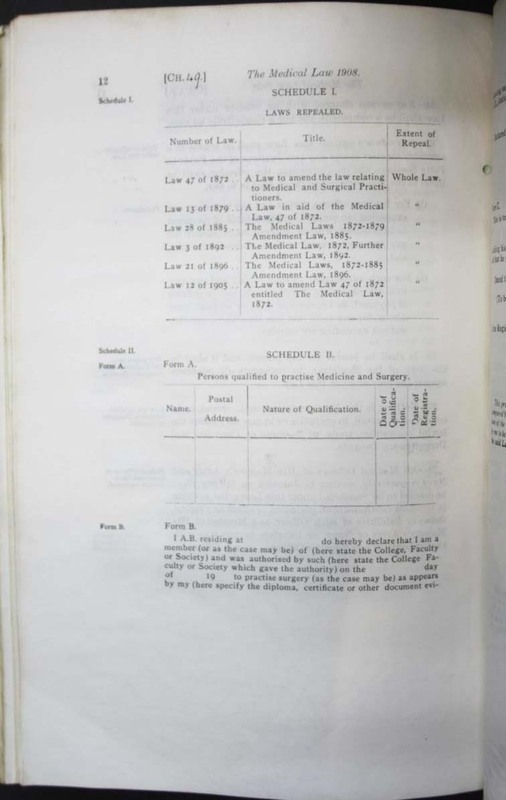 Provided that any Licensed Druggist who shall, from over the counter in his drug store, administer any drugs, or medicine in any case of simple ailment, shall not be guilty of an offence under this Law. (2.) Provided also that no person shall be guilty of an offence under this section, if he satisfies the Court that the services of a registered medical practitioner were not obtainable at the time of the alleged offence. (3.) 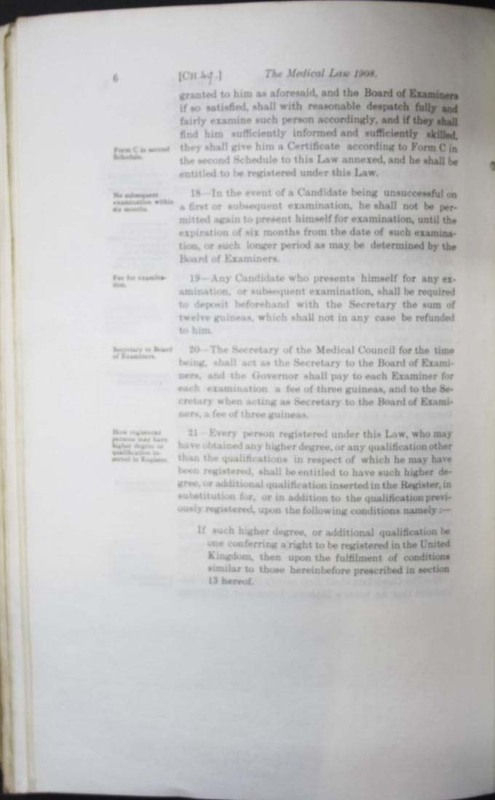 Provided also that this Section shall not apply to any duly qualified Homaeopathic, or Electro-Homaeopathic Practitioner, who shall at the time of the coming into operation of this Law, have been in continuous practice in this Island for two years previous thereto. 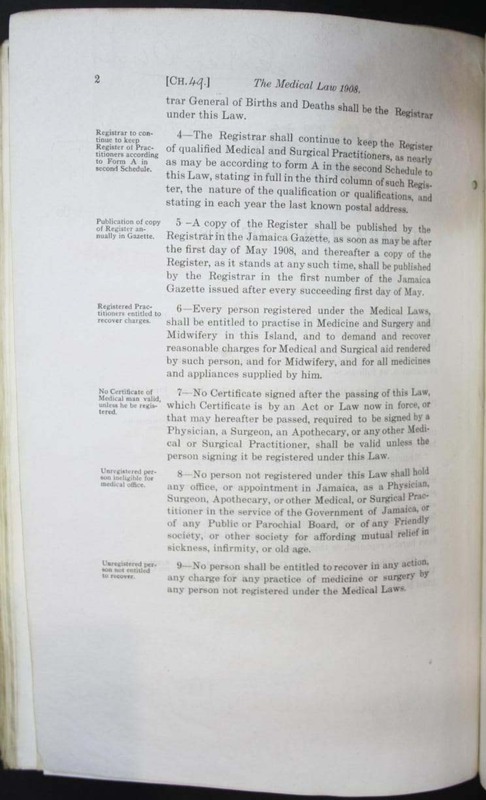 33 – Any person, who is not registered under this Law, who shall pretend to be, or take, or use the name or title of a Physician, Surgeon, Doctor of Medicine or Surgery, or Master of Surgery, or take or assume any other style, title, addition, designation, or description, implying that he is qualified to practice Medicine, Surgery or Midwifery, or that he is recognized by Law as a Physician, or Surgeon, or Licentiate in Medicine or Surgery, or a Practitioner in Medicine, shall be guilty of an offence under this Law. 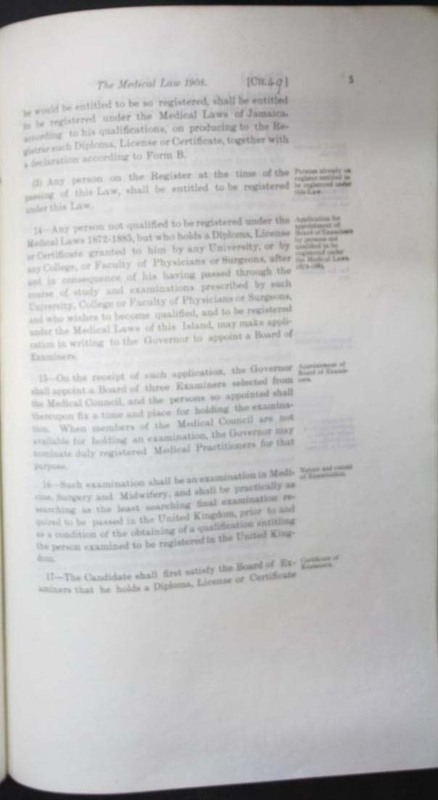 The absence of the name of the person charged from the last number of the Jamaica Gazette, containing a list of registered medical practitioners, shall be prima facie evidence that such person is not registered. Provided nevertheless that this Section shall not apply to any duly qualified Homoeopathic, or Electro-Homoeopathic Practitioner who shall, at the time of the coming into operation of this Law, have been in continuous practice in this Island for two years previous thereto. 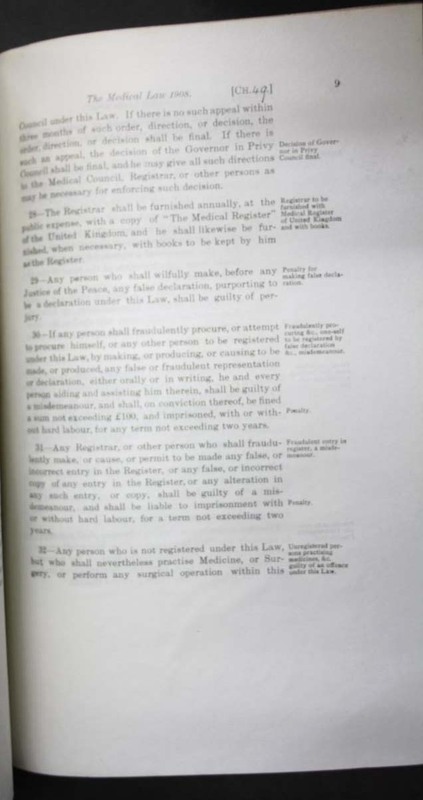 34 – Any person charged with an offence under this Law shall be a competent, but not a compellable witness. 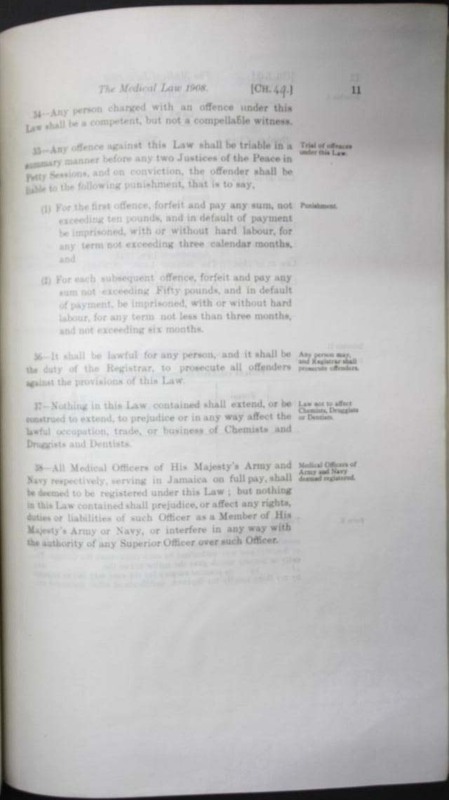 (2) For each subsequent offence, forfeit and pay any sum not exceeding Fifty pounds, and in default of payment, be imprisoned, with or without hard labour, for any term not less than three months, and not exceeding six months.